Today we’re pleased to feature a guest post from CFI and DPE Jason Blair. Check out his previous contributions to the LTFB here. He writes his own blog at JasonBlair.net. UPDATE: we’ve since posted a follow-up companion blog post on physical preparation. Click here to read it. The stress of a practical test is something that can leave any pilot concerned about their performance abilities, even those that have taken many practical tests already. 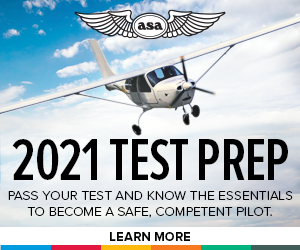 The FAA’s “IM SAFE” checklist highlights stress as a key component to being a safe pilot, and being a safe pilot is part of practical test day. (To read more about the IM SAFE checklist and aeronautical decision making, check out Chapter 17 in the Pilot’s Handbook of Aeronautical Knowledge.) A few tips can help any pilot mentally prepare for a practical test. Getting yourself organized prior to the test will help reduce mental stress. Make sure your applications are complete, you have finished all the required flight times, your charts and study materials are available, and your aircraft is reserved for the day of your test. There are certainly other things that you can include in your organization efforts, but whatever they are do them ahead of time. Waiting until the last minute means a greater chance of forgetting things. Think your way through what you will need to make the test day go smoothly and get your stuff together. A little organization, even a list or two, can keep you focused. Unless this happens to be the very first test your particular examiner is giving, your instructor or other pilots will probably be familiar with the examiner’s previous testing activities. There may even be some “gouges” available on the examiner. While examiners do change the content of their tests so they aren’t the same every time, there is only so much latitude an examiner has within the practical test requirements for what they will test. Talk with others to get an idea what the examiner is like to reduce some of the mystery of the practical test. Most examiners don’t mind talking with an applicant prior to the test when time allows. Getting a briefing from the examiner about the structure of the testing process, what will be expected of the applicant, and if the examiner has any information they would like the student to be aware of or consider for test day will allow for some pre-planning and a better understanding of the testing process. This can allow any applicant to better prepare mentally for how long the test will take, what will be tested, and how the examiner will conduct the test. Mentally preparing for a test requires that the pilot be rested. Showing up to a test after only three hours of sleep or after working an all night midnight shift is not going to result in a mentally prepared, or at least a mentally sharp, test applicant. I know this sounds like a simple consideration, but many applicants still show up every year mentally fried, just wanting to get the test done after not getting enough sleep. If you just got fired from your job, you’re getting a divorce, or your truck broke down it probably isn’t the best day to take a practical test. If all of these happened, you are probably in a country song. But seriously, if you have a major life stress event happening, seriously consider rescheduling. A practical test does require your full attention to perform to your best ability, so don’t try to do this when other life circumstances may cause you to be distracted. An examiner is a person too, and if you call them to reschedule because of a major life event they will understand and not hold it against you. It shows good pilot decision-making to the examiner when you are aware of how these events could affect your performance and choose to not fly when your abilities may be less than optimum. I tell most of my students and practical test applicants that “nervous” is OK but “scared” is bad. A little self-evaluation can help you figure out if you are “nervous” or “scared” of the test. If you are still scared, it is probably an indicator that you don’t feel prepared. Nervous is normal, and if you really feel mentally prepared for the test you shouldn’t be scared. Be honest with yourself. If you aren’t mentally prepared for the test, wait to schedule it until you are really ready.